The earliest reference to Kenilworth occurs in the Domesday Book, of 1086, where we find that Kenilworth was a small settlement of about 100 villagers living in a clearing in the Forest of Arden, belonging to the Royal Manor of Stoneleigh. Within the space of 40 years, for reasons that are unclear, Geoffrey de Clinton, Chamberlain to Henry I, determined to build what was to become possibly the most magnificent castle in England, in this obscure forest clearing. A local outcrop of good building stone would have been one factor for selecting this spot. 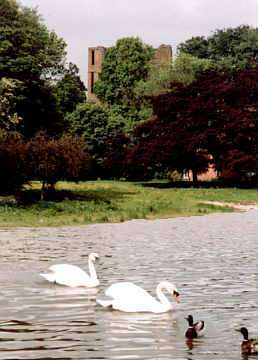 The picture at the left shows part of the present day lake in Kenilworth's Abbey Fields. In medieval times there was a large Abbey on the hillside just to the right of this picture. 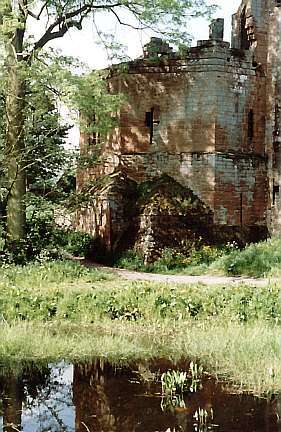 In the background can be seen the towers of Kenilworth Castle. In medieval times the streams that feed this lake were dammed near the castle. This created the largest artificial lake in the kingdom, over a mile long, surrounding the castle. 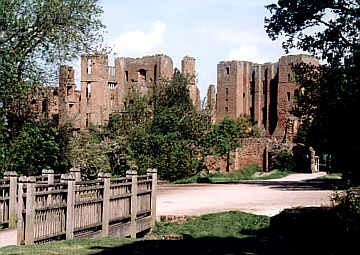 Kenilworth Castle was established by Geoffrey de Clinton, Chamberlain to Henry I, in about 1122. Warwick Castle was founded slightly earlier, shortly after the Norman Conquest. 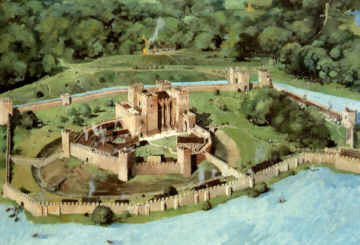 The picture at the left is an artists impression of the castle at the time of King John, surrounded by its great lake. 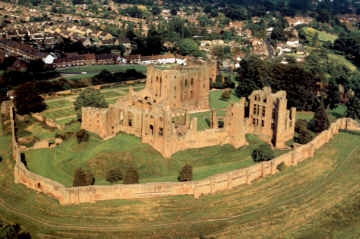 This picture, and the present aerial view of the castle, below, are both taken from the castle guide book, Kenilworth Castle, by Derek Benn. (All other photos are my own). This is the Norman Keep. It is one of the oldest parts of Kenilworth Castle, and was designed to be an impregnable military fortress. The great stone walls are up to 20 feet thick. The wide base of the towers was designed to prevent attempts at undermining the walls. In a siege in 1266 the castle resisted every form of military assault. The defenders only surrendered after a siege of nine months, when they were debilitated by an epidemic within the castle. 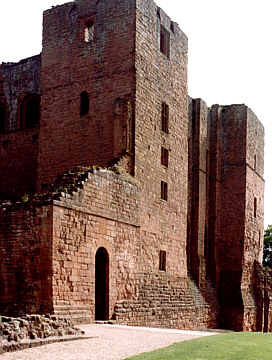 Many English kings contributed to the construction of Kenilworth Castle. The central block on high ground in the centre of this picture is the Norman Keep. King John added the outer curtain wall and towers. In the late 14th century the castle was owned by John of Gaunt, who began its conversion from a fortress into a palace. He added the Great Hall, which is the building at the left of the Keep in the picture. 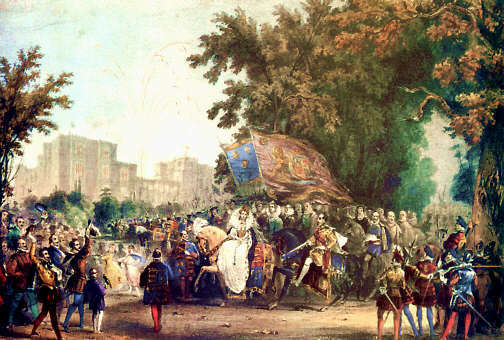 This process continued under Robert Dudley, Earl of Leicester in the 1570s, who added the Leicester building, a large apartment and residential block overlooking the lake. This is the tall structure at the far right of the picture. The picture at right shows the remains of John of Gaunt's Great Hall. John of Gaunt was a son of Edward III. On Edward's death the crown passed to Richard II, who was only 12, and John of Gaunt was in practical terms king of England. John of Gaunt's eldest son, Henry Bolingbroke deposed Richard, and became Henry IV. Henry IV probably spent some of his childhood here. John of Gaunt's daughter, Joan, married Ralph Neville, and their son Richard was father of Richard Neville, Earl of Warwick, the Kingmaker. Henry IV's son, Henry V (Prince Hal) constructed a pleasure garden at the far end of the great lake, and retired here briefly after his victory at Agincourt. Kenilworth was one of the five licensed tournament grounds in England where knights could meet. In a tournament held in 1279, 100 Knights and their Ladies assembled. This assembly was known as the Round Table of Knights. The term Round Table is used in the description of the event in Dugdales Antiquities of Warwickshire. Dugdale states that it was called the Round Table "to avoid contention of Precedency". A raised causeway outside the castle, shown at the left, was the tiltyard where the Knights of the Round Table competed in jousting before their Ladies. This picture, from the Kenilworth Castle Guidebook, is an artists impression of a tournament in progress. This picture is looking at the tiltyard from approximately the same position as in the photo just above. The picture at the left shows one of the towers along the southern part of the curtain wall. This particular tower is known as the Water Tower. There is still a small moat, visible in the picture, along this part of the wall. 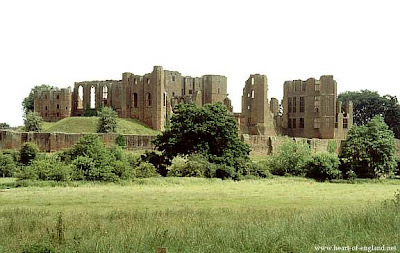 Kenilworth Castle changed hands twice during the Civil War, without much fighting. After the Civil War, under Cromwell's instructions, parts of the walls and one side of the keep were demolished, and the great lake was drained, to prevent the castle from ever being used as a royalist garrison. The gatehouse, Leicester's Gatehouse, shown here, was built by Robert Dudley, specifically as an impressive entrance for Elizabeth. 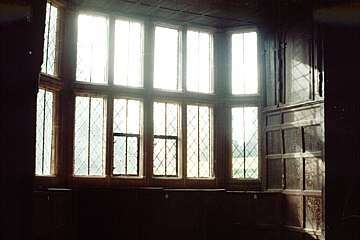 The rooms in Leicester's Gatehouse are very occasionally opened to the public. This is the "Fireplace Room", which includes an elaborate fireplace, with heraldic carvings, dating from Leicester's time. In 1984 English Heritage became responsible for the castle. I believe that English Heritage have long term ideas of restoring these rooms, and using some of them for educational purposes. The fine stables, inside the castle wall, constructed in Tudor times, have been preserved. The stables now accommodate a tea room and a gift shop. 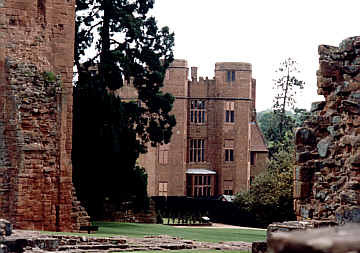 The high point of Kenilworth Castle's history was under the ownership of Robert Dudley, Earl of Leicester. He was the favourite of Elizabeth I.
Elizabeth was daughter of Henry VIII and his 2nd wife, Anne Boleyn. Henry had a daughter, Mary, by his first wife, and son, Edward, by his third. On Henry's death, in 1547, Edward, aged 10, became King. Edward died in 1553, and Mary, a Catholic, became queen. Mary died, without an heir, in 1558, and Elizabeth became queen. England was, at the start of Elizabeth's reign, a weak country. Elizabeth was under heavy pressures to form alliances, through marriage, with other countries, France and Spain. And there were struggles at home, between Catholic and Protestants, trying to manipulate Elizabeth to further their own beliefs. But Elizabeth was strong-willed and independent and resisted such manipulation. Her own choice in love was Robert Dudley an attendant at court, a choice was not appreciated by any of her advisors. Elizabeth did not marry and devoted her life to her country. There have been many films made about the early years of her reign. The two pictures here are from the version staring Cate Blanchett and Joseph Fiennes. Robert Dudley made elaborate extensions to the castle. The towering apartments he constructed, Leicesters Building, were somewhat like a great hotel overlooking the lake. Elizabeth's visits culminated in her visit of 1575. This visit included a firework display and elaborate water-borne pageant on the great lake. The visit is believed to have been seen by the young Shakespeare, and is believed to have been an influence on Shakespeare's Midsummer Nights Dream. It also forms the background to Sir Walter Scott's novel Kenilworth. "Raised on an easily mounted hill, plentifully well sorted on every side. To the West is a goodly pool of rare beauty, and store of all kinds of fish and wild fowl. By a rare situation and natural agreement this pool seems conjoined to the castle. To the north and west a goodly chase vast, wide, large, and full of red-deer and other stately game. Beautified with many delectable, fresh, and shaded bowers, arbours, seats and walks, that with great art, cost, and diligence were very pleasantly appointed. Which also the natural grace, by the tall trees, did so far commend, as Diana herself might have deigned there well enough to range for her pastime." 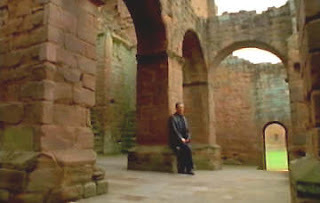 Kenilworth Castle was featured as a backdrop in the 4th episode of Simon Schama's TV series A History of Britain. 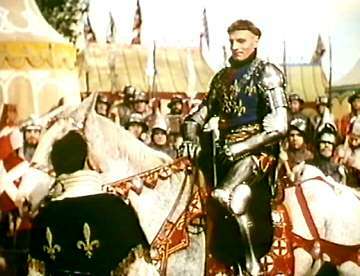 This episode dealt with the reigns of Henry III and Edward I. The story told of the opposing power of the Barons, led by Simon de Montfort, and the Barons war. "Henry gave Simon two royal castles, one of them the immense and grandiose Kenilworth in Warwickshire. It quickly became more than just a baronial fortress; it was, rather, a centre of courtly and even scholarly life, which completely overshaddowed any other noble residence in the country." Simon de Montort was protrayed as an idealistic hero. Simon had travelled to the Holy Land on the Crusades. On his return Simon became the driving force behind criticism of the monarchy, and which developed into the Baron's War. 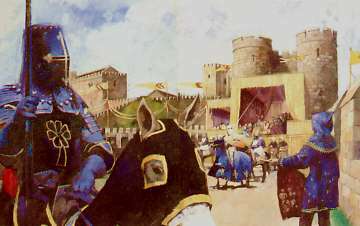 One of the main incidents in the War was a siege of Kenilworth Castle by Henry III's forces. After the seige of Kenilworth the Barons were defeated, but the King's influence was curbed. Simon was also the only Baron who wanted to go beyond reclaiming power from the King, and to support some form democratic participation in government by the people themselves. We could see for the first time a relationship between the 3 levels of rulership - Edward (the monarchy), the Barons (the aristocracy) and the people (democracy). The main hotel in Kenilworth is named after Simon de Montfort. A Victorian lithographer, John Brandard, produced a series of illustrations of Kenilworth Castle. Kenilworth is indebted to John Drew for reproducing these pictures, in a limited edition book, Kenilworth Castle Illustrated, which is in the Kenilworth Public Library. The book also includes some drawings made in the 19th Century when much of the stonework was covered by ivy, and which gave the castle a very Romantic appearance. 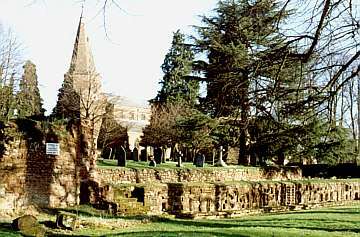 An Augustinian Priory in Kenilworth was founded between 1123 and 1129 by Geoffrey de Clinton, at the same time as he built the castle. Geoffrey de Clinton founded the Priory as a spiritual act of gratitude, in response to being given the land on which to build the castle. A priory is generally a monastic house reporting to a cathedral; an abbey is generally independent. 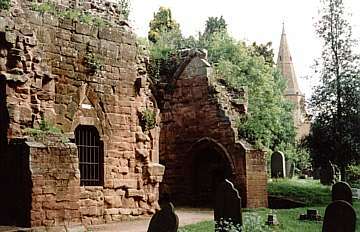 Other nearby houses included Cistercian abbeys at Stoneleigh and Coombe, and a Benedictine Proiry at Coventry. The various orders refer to the rules the monks lived by. Members of the court of Henry had a preference for founding Augustinian orders. 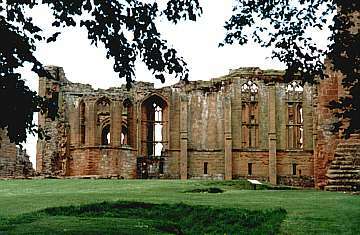 In 1447 Kenilworth Priory was raised to the status of abbey, possibly due to its connections with the crown. 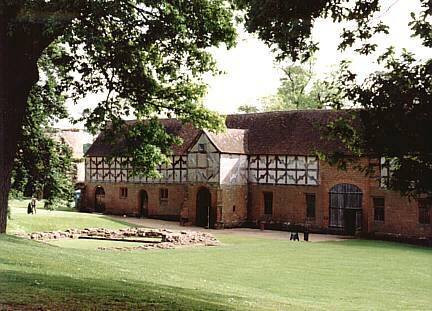 The Augustinian Abbey at Kenilworth became one of the wealthiest in the country. 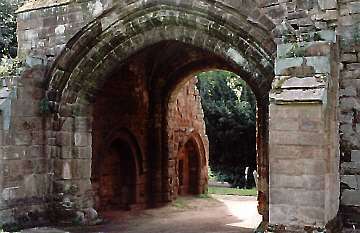 By the 16th century, 17 churches in the area were held by Kenilworth Abbey, the largest number for any abbey in the county. The once great Abbey covered a large area, though only two significant structures above ground are still visible today. The pictures above, and at left, show what remains of the Abbey Gatehouse. The Abbey formerly covered the area between the Gatehouse and St Nicholas' Church, just visible in the background. 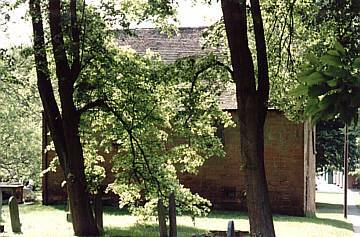 Part of the Abbey foundations, with the parish church in the background. This surviving building now houses a small museum. The abbey was dissolved, with the dissolution of the monasteries, in 1538. Some of the stonework was taken by Henry VIII, and later by Robert Dudley for building work on extensions at the castle, and some used to extend other churches. 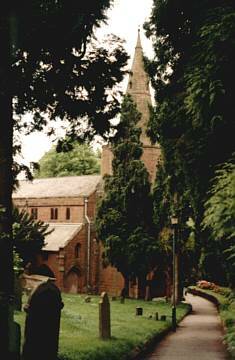 A monastic house sometimes had an associated parish church, and close to the Abbey is St Nicholas' Church. 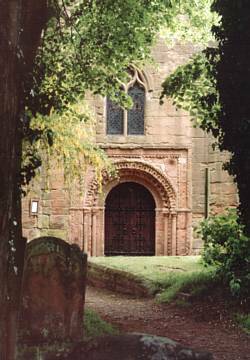 The arch around the church doorway, shown at the left, is believed to have been taken from the Abbey, and is described by the architectural historian Nikolaus Pevsner as the "most sumptuous Norman doorway in Warwickshire". When Geoffrey de Clinton built Kenilworth Castle and founded Kenilworth Priory in 1125 he made, in some sense, a bargain with God. Over the next four centuries the castle grew in strength and splendour, and the Abbey amassed vast wealth. When Henry VIII, and Robert Dudley, plundered the Abbey, Geoffrey's bargain was, in a sense, broken. Whether it was by fate, or otherwise, within 75 years of Robert Dudley's spectacular entertainments for Elizabeth I, his impregnable and magnificent castle lay in ruins. 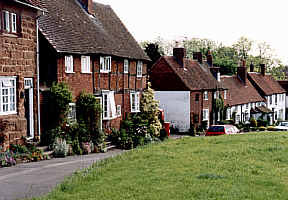 The main street of the original town of Kenilworth ran from the Castle Green, just outside the castle, shown at the left, and along the High Street. High Street forms the direct straight-line route between the castle and Coventry, and this was the principal road in Kenilworth in medieval times. The demands of building work, and the day-to-day running of the castle, brought wealth and employment to the town. After the Civil War, and the loss of the castle and its royal patronage, the people of the town were reduced to a period of relative poverty. Kenilworth was situated on the sheep droving road, an ancient path which runs from the Welsh hills to London. This path comes down through Brownhills, Stonebridge, and Berkswell. It continues on through Southam, Buckingham, and Leighton Buzzard to London. Kenilworth then became, like many similar towns, a small market town, supporting a range of local industries, including candle-making and the manufacture of agricultural implements. In 1900 the population of Kenilworth was around 4,500. By 1970 it had grown to over 20,000. The name Kenilworth is composed of two elements, someone's personal name, a name now taking the form Kenil-, and the suffix -worth. -worth is a common place-name suffix and means "fence" or "enclosure" . It has a similar meaning to the place-name suffix "ton". There is a long list of English places name which have the -worth suffix in The Origin of English Place-Names, by P Reaney, p 129-130. Some examples: Hurworth, Shuttleworth, Butterworth, Harmondsworth, Rickmansworth, etc, etc. In all of these examples the place name is pre-Norman conquest. The -worth suffix is usually used for settlements of between 4 and 120 hides. A hide is about 120 acres. The first syllable of such names is often a personal name. In the case of Kenilworth the first name is believed to be Cynehild, which is a Saxon woman's name. In the Domesday Book the earliest form of the name which became Kenilworth is spelt Chinewrde. The Oxford Dictionary of English Placenames lists recorded references to the place as Kenildewurda in 1165, and Kenillewurd in 1190.